At the side of every bed, there should be a nightstand where you can place a lamp (for night time reading), alarm clock, and your cell phone. The Broyhill Chairside Table is the perfect bedside table for your bedroom. It features usb and power outlets to plug in your alarm clock or cell phone for charging. It not only serves as a nightstand, but you can place it in your living room or family room as an end table. Place it adjacent to a couch or next to your recliner, so you have a place to put your drink or the remote control as you're watching tv. It's a versatile piece of furniture that will look great in any home. If you're looking for something similar, also consider the Universal Broadmoore Chairside Table also from Costco. 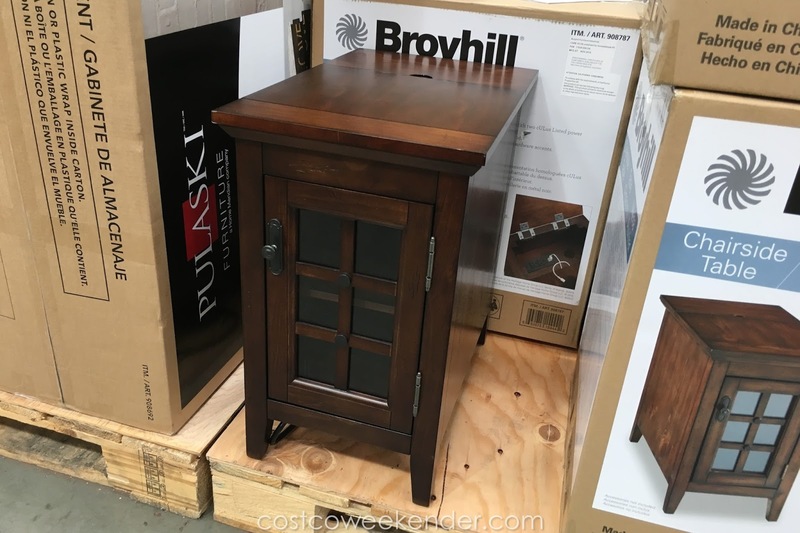 If you're searching for a little extra closed storage space in your living room, family room, office, den or even an entryway, the Chairside Table by Broyhill is the perfect spot to house remotes, magazines, coasters, movies, video games, blankets or throws. I'm confused. There is no record of this item anywhere that I can find. Costco doesn't know what it is. Broyhill doesn't know what it is. It isn't on Amazon, or Ebay, or any other sales website. Can anyone find this for me? Hello @Anonymous, that's kind of strange that Costco doesn't even keep track of their own products that they sell. 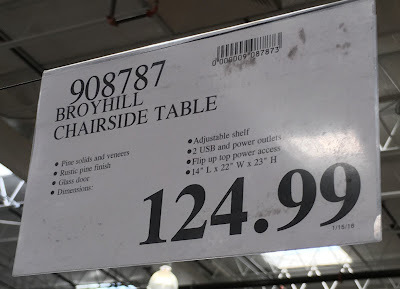 Anyway, I saw the Broyhill Chairside Table at the Costco in Redwood City, CA. I have similar obversations as well, A lot of times These items are made by known manufacturers , but the particular model is not even listed on the manufacturers website. Hence you don't find it anywhere else. Costco sells that piece of furniture at highly discounted prices, whereas the same manufacturer for a similar item on their website/store might be selling it under totally different name for a much higher price. Hello @Anonymous, to your point, sometimes manufacturers make certain products or items only to be sold at Costco. I know this to be the case for some bbq grills. This could be the case for the Broyhill Chairside Table as well. In January, this was in Madison. Sold out and haven't seen it since. I should have got the floor display. Hi @Unknown, that's the thing about Costco. If you see something you like, you really have to pull the trigger. It always happens to me where I see something and decide to mull it over, just to come back to Costco to purchase, and it's gone by then. And usually that sense of regret sets in for not acting sooner. Hopefully, Costco will bring back the Broyhill Chairside Table or at least something similar sooner rather than later. At least then, you'll know to get it. Good luck! I found this in a Home Goods in Colorado, but in a weathered gray only. I have also been searching online, even on Broyhill's site, and it's as if it doesn't exist! Hi @Unknown, thanks for letting us know that the Broyhill Chairside Table is also available in a weathered gray color at least in Home Goods in Colorado. We don't have Home Goods here in CA, but I'm sure people in your area will find this information quite useful particularly if they don't like the regular dark brown color. Found a weathered gray at Home Goods in Bainbridge, Ohio. Now, I need to find one more! Love the look & functionality. Thanks for letting us know that you also found the weathered gray Broyhill Chairside Table at Home Goods but in Bainbridge, Ohio, @Phyllis! I have still yet to see the weathered gray version at Costco. Now I kind of wish we had Home Goods here in California as well. It's great that you love your table. Ya, the Broyhill Chairside Table is definitely a versatile piece of furniture to have since it makes for a great night stand for your bedroom or end table in your living room. Hello @Anonymous, oh what a bummer. Ya Costco has a lot of good deals that you end up getting that feeling of regret when you should've pulled the trigger. Well, at least you were able to get one of the Broyhill Chairside Tables at Costco. The Broyhill Chairside Table is a good piece of furniture to have, but it sounds like it's great to have in a camper where space is limited. I'm glad though that you're making good use of the one that you do have. I just bought one at HomeGoods in Columbia, MD, in the weathered gray. Would love to find another. Excellent quality at an excellent price. Thanks @Anonymous for letting us know that the weathered gray Broyhill Chairside Table is available at the HomeGoods in Columbia, MD. Now I'm really interested in seeing what the weathered gray one looks like since I've only seen the brown one and everyone seems to be talking about the gray version. Bought 1 in the Portland OR area last December...been kicking myself ever since, since it went away that fast. By the first week in Jan, no store in our area had them. It's an awesome table, even Broyhill isn't selling it. Hi @Anonymous, I'm glad that the Broyhill Chairside Table is totally working out for you. It seems to be a very popular piece of furniture that Costco has no problem selling these, so you better take advantage of it when you see it at Costco. has anyone been able to find these online or even in the burbank, ca costco? i really want one! Hello @ilolgirl, I haven't been to the Costco in Burbank, CA, but I haven't seen the Broyhill Chairside Table at any Costco since I first spotted it almost a year ago. If I do happen to see it again, I'll be sure to post it and link to it from this page. Oh I had no idea that the Broyhill Chairside Table was featured in the January 2017 Costco Connection magazine, @Anonymous. I actually haven't gotten a chance to take a look at it yet. 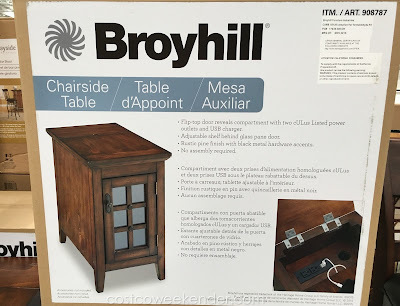 I'll definitely keep an eye out for the Broyhill Chairside Table since it's expected to make its return to Costco soon enough. I just bought this in weathered gray at Home Goods in California... looking for another one! Does not seem to exist online. 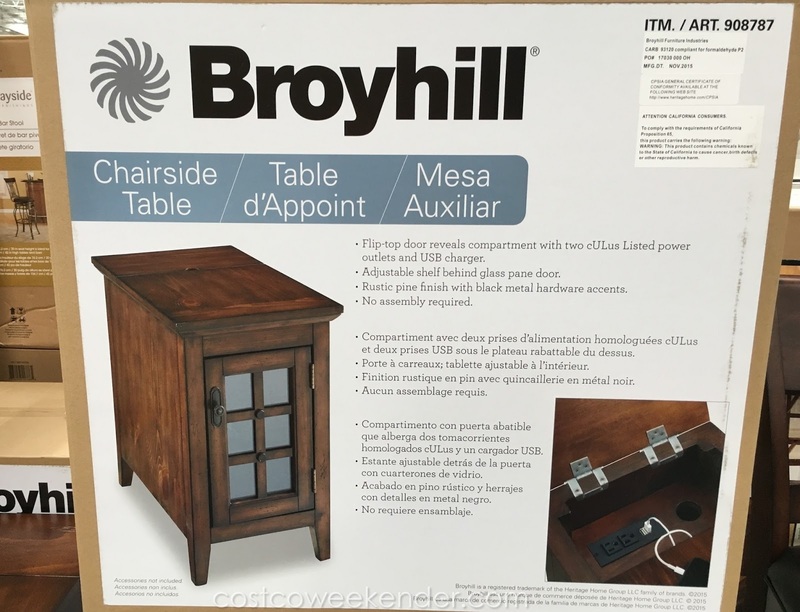 Hi @Laura, that's great that you're loving your Broyhill Chairside Table that you want another. I've never actually seen the weathered gray Broyhill Chairside Table in person nor online. Hopefully, one will turn up in order to complete your set. Good luck! @Laura, I hope you're reading this, but I actually found the Broyhill Chairside Table in a weathered gray at the TJ Maxx in Fremont, CA! I spotted it this past Friday (Feb. 2, 2018). I've never actually seen the weathered gray until now, but I posted some pictures above. There was only one left, so I hope you're close to the Fremont area.